Gregg is the CEO of Innovative Management Services. This is a company who specializes in providing interim and part time CFO, COO and CEO services. His company also provides accounting, business plan development and strategic planning services to our business community. Gregg is the immediate past Chair of the Red Cross. He is currently the Chair of “Move.Tallahassee,” this is a Tallahassee, FL walking group working in conjunction with the local paper, the Tallahassee Democrat. Morgan is an RN, who after 23 years in the Tallahassee Memorial Emergency Room, decided to shift to a less stressful environment and now teaches nursing at Lively Technical Center. She served as the immediate past President on the Board of Directors at Unity Eastside Church and has been practicing mediation for 41 years. This led her into teaching mindfulness meditation to high school students as well as in women’s prisons. Later this year she is publishing her first book. As a team, Gregg and Morgan are working on a book about their travels and lessons learned while on their 500 mile journey across the Camino in Spain. Morgan and Gregg have been married for 26 years and have raised four accomplished children Sean, Gregg II (Pat), Candace & Jessica. Between the four children they have brought five grandchildren into the family; starting with the oldest Tyler, Sophia, Layla, Jillian and Shepherd. Morgan and Gregg both love playing an intricate roll in the lives of their children and grandchildren. The paradigm change – how we got to Its Incredible Out There! During the summer of 2014 the local media in Tallahassee followed Gregg and Morgan Patterson as they made the 500 mile trek across Camino de Santiago starting in St Jean de Port, France. 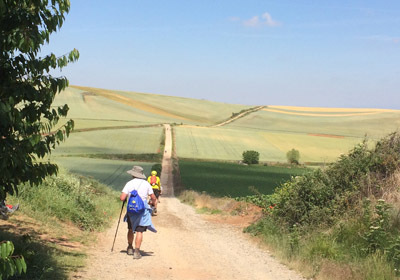 The Camino is a 2000 year old pilgrimage and is known by many as the way of St James. This was a spiritual quest for Morgan. Gregg went along for the athletic challenge. Then something amazing happened. They share this “something” during their speaking engagements. This trail tracks over several mountain ranges, through the countryside and cities of northern Spain. Their journey took 38 days before reaching the end in Santiago, Spain. Traveling with only the meager possessions in their backpacks, they stayed mostly at hostels breaking bread with people from all over the world. During their talks both Gregg and Morgan share both the physical and mental challenges of this journey. Most importantly, they share life lessons learned on the Camino.